If it’s time to replace the roof of your Middletown home, consider installing the Decra Stone Coated Steel Roofing System. This is one of our favorite roofing materials at Serrano II, Inc. because it stands up well to high winds and the wet and cold New York climate. 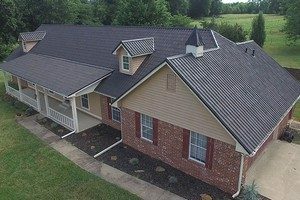 Our Middletown roofing company has done a lot of roof replacements since 1968, so we are very familiar with the different roofing systems available. We recommend the Decra Stone Coated Steel roofing systems to our customers who want a very durable shingle. It is a great choice for homes, condos, home owner’s associations, and commercial pitched-roofs too. Here’s why. Every roof will age over time, so you can’t avoid replacing the shingles. After the decades of superior protection that the Decra Stone Coated Shingles provide, these steel shingles can be recycled. Not only do they not take up space in a landfill, they contain 25 to 30% recycled content already. If you want to do your part in reducing the ecological damage to our earth’s resources, this roofing system is a top choice. The panels are stamped with an overlay. With each stamp, the strength of the shingle is increased. The baked-on epoxy coating makes them super durable and very superior to other shingles. The stone granules covering the steel shingle make this roof very tough. There is a lip that locks in underneath the panel below it on every panel. This locking system makes them an excellent barrier to the weather. Since everything locks together and is screwed in, the wind cannot get underneath them. The screws will be covered in most places and a few will be coated by the roofer so that you can’t see them. The valley is all one piece and a cap covers the actual metal. The Decra Stone coated steel shingles offer architectural style to the roof. From the ground or road, it’s hard to tell that they are a steel shingle. They look like other architectural shingles which give dimension and design to the rooftop. The Decra steel shingles come in styles that look like real tile, architectural asphalt shingles, and wood shake shingles. Plus, there is a whole range of shingle colors to choose from. If you would like to learn more about Decra Stone Coated Steel Roofing Systems in Middletown, NY or our other service areas, please call 845-692-2226 or fill out our online request form.